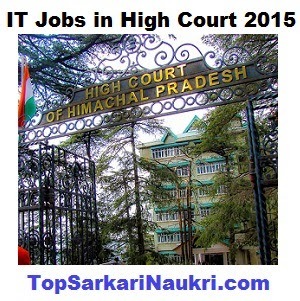 High Court of Himachal Pradesh invites all eligible candidates to apply for the Computer Programmer and Assistant Programmer on contract basis through ongoing recruitment process. Candidates have to apply on or before 9th February 2015. Candidates must have B.E./B.Tech in Computers or I.T./M.C.A. or equivalent degree in Computer Science from recognized University/Institution in First Division with two years working experience as a Computer or Software Engineer or System Officer (Computers) or on equivalent post in the field of Computers. Candidates must have B.E/B.Tech. In Computers or I.T. or equivalent technical qualification at least in Second division. Fees: Please refer to original advertisement. How to Apply: Interested Candidates needs to send duly filled application form on below mentioned address with all relevant documents along with postal order as per your category mentioned in the advertisement. Registrar General, High Court of H.P. Top Place to find sarkari naukri 2015 for IT Department.